Hi Mom! It’s me, Lightning! Happy Mothers Day! Sometimes I wonder if you’re still alive. I know you could be, even though I’m almost 70 years old myself. Here’s a recent picture of me . . .
I’m taking a lot of naps now that I’m older. Although come to think of it, I took a lot of naps when I was younger too! I can’t move my legs very well now — my back legs, mostly. They don’t hurt, but I can’t feel them very much and I can’t tell where they are. 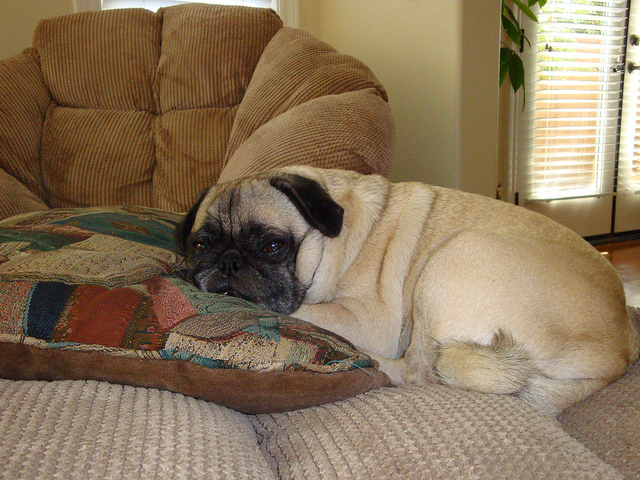 It’s funny that I used to be the fastest pug and now I’m the slowest. Nothing lasts forever. Everything ends so don’t take anything for granted, even for one day. If you don’t hear from me next Mothers Day, it’s not because I forgot. If I go to heaven first, I’ll wait for you and we’ll all be together again!